Studsvik has been awarded a contract by OKG for the treatment of metallic waste resulting from the modernization of unit 3 of the Oskarshamn nuclear power plant in Sweden. Under a contract worth SKr28 million ($3.5 million), Studsvik will treat some 1400 tonnes of metallic waste from the reactor. The company will analyse and segment the metallic waste, which will then be decontaminated and melted down. Measurements will then be taken to determine the parts of the material that can be radiologically cleared. According to the contract, Studsvik will be responsible for transporting the material to and from its facility. Studsvik said that the aim is to be able to give radiological clearance to as much of the material as possible. It said that normally about 95% of metallic material of this type can be free released after treatment. The free released material can be recycled and used as raw material in the foundry industry, while the remaining material is returned to the customer for final disposal. Magnus Groth, CEO of Studsvik, said, "This is a large contract for Studsvik, with a volume equivalent to almost half of a full year's production for our Swedish facility." 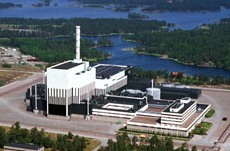 In 2006, OKG decided on a SKr1 billion ($126 million) investment in order to increase the electrical output at the Oskarshamn 3 boiling water reactor (BWR). The project, planned to be carried out during 2008, will increase the unit's capacity by some 20%, from 1200 MWe to 1450 MWe. The modernization project will also extend the reactor's operating life to 60 years and improve reactor safety according to new regulations. Westinghouse has been contracted to renew some of the internal parts in the reactor and to upgrade all safety functions. A corresponding agreement has been signed with Alstom in order to adapt the turbine equipment and the electric power system to a higher power output. At the end of October, OKG announced that the start date for work on the modernization of Oskarshamn 3 had been rescheduled for 1 March 2009, with work expected to be completed by 30 May. The work was previously planned to start in the autumn of 2008, but OKG chose to postpone the work due to delays in delivery of technical documentation and heavy components. Studsvik said that it expects to be able to start transporting material from the reactor to its facility near Nyköping in the second quarter of 2009. Oskarshamn 2 is also to undergo upgrading that will increase the unit's installed capacity by more than 30 MWe. Siemens Power Generation was awarded a contract to upgrade the low-pressure turbines at the 610 MWe BWR. Siemens will also supply other related components and a new instrumentation and control system. The upgrades to unit 2 are planned for completion in 2009. A modernization programme completed in 2002 at Oskarshamn 1, which included the replacement of the turbines, raised that unit's capacity by 22 MWe.